"Desh" is a West Bengal's traditional literary base Bengali fortnightly magazine which is published from Kolkata city. It has been publishing on 2 and 17th of every month by Anand Bazar Patrika Group. This old but all time update Bangla magazine is the best literary related magazine for Bangla speaking people. Now I want to share a pdf file of Desh 2nd November 2018 edition. 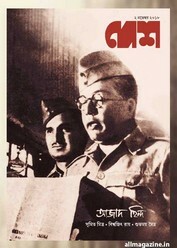 The inner story of this edition are- various topics about the great Azad Hind Force, Granthlok topics about Nazurul, remembering poet and editor- Poulomi Sengupta, four stories by Ashok Bhattachariya, Tamal Bandyopadhyay, Sanjay Dasgupta, Jhimli Nandi, serial novel- Jonakider Bari by Smaranjit, poems, Suduku and many more topics. All readers can collect this fortnightly issue- '2nd November 2018' in pdf.